Cathy at outdoorsin.wordpress.com has a wonderful segment on terrariums as decorative elements at her website. 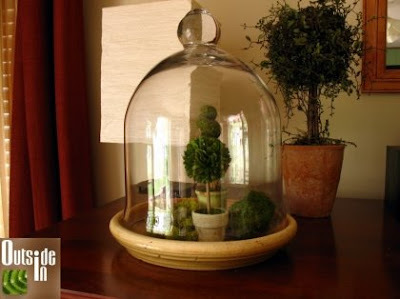 Her terrariums are so artful and in such beautiful containers. It really inspires me to move my terrariums from under my desk in my room to other places in the house. Mine are so touchy though- every time I move one from one windowsill to another it seems to have a freak out. actually think you are better at it, especially the live and natural looking terrariums. I never really thought of them as decorative elements till you two inspired me. Thanks. Yep, Cathy has been doing a nice job. I'm envious of her shelves for all her lovely plants.